At less than a buck a game, this baby's fully loaded with 30 of your all-time favorites! 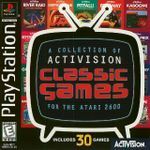 In the first and largest arcade collection of its kind, Activision classics gives you all the gameplay of the original Atari 2600 games - now for your playstation game console. Activision Classics: It's serious old-school fun.